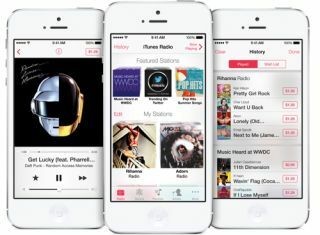 Apple launches iTunes Radio music service | What Hi-Fi? Apple has officially launched iTunes Radio, a new music streaming service built in to the new Music app in iOS 7 and due for release later this year. It will be available on iPhones, iPads, iPod Touch, Apple TV and Macs. The new music service launched alongside iOS 7 at the Apple WWDC event today. iTunes Radio release date has been announced as "coming this Fall". It's due for release in the US first and other territories and hopefully the UK after that. Apple iTunes Radio features music discovery through Apple recommended stations or through the creation of new 'radio stations' based on artists or songs. The service will be free with ads or available without ads for those who subscribe to iTunes Match, which costs £21.99/year in the UK. There was no word on bitrates or streaming quality - the iTunes Store currently sells downloads as 256kbps AAC files. Rumours had previously circulated that Apple might at some point offer hi-res downloads or streams. This remains a pipe dream for now and we will have to wait and see regarding iTunes Radio sound quality. It will feature more than 200 stations and a catalogue of music from the iTunes store. There will be Featured stations curated by Apple and genre-focused stations personalised for each user. iTunes Radio evolves the more music you play and download from iTunes – in effect it learns your musical preferences. iTunes Radio will also give exclusive 'first listens' to tracks from top-selling artists, and includes Siri voice-control integration, as well as the ability to tag or buy anything you hear with one click. Siri voice control is built into iTunes Radio. For example, ask Siri “Who plays that song?” or “Play more like this” and Siri will duly oblige. Say something like “Play jazz radio” or ask for any of your existing favourite stations and genres and they'll be played. You can even customise your stations by telling Siri what you like and don’t like, or tell it to pause, stop or skip the music. You can also ask Siri add songs to your wishlist to download later. Whether all this will be enough to persuade Apple users to stop using other streaming services like Spotify remains to be seen. Apple's Worldwide Developer's Conference kicks-off today, with the keynote set to start at 6pm UK time. Apple is widely expected to release iOS 7, the latest version of the operating system for Apple iPads, iPhones and the iPod Touch. Also tipped to be revealed is a new streaming music service as part of iTunes (see more below), plus possibly new MacBooks, maybe even a new Apple TV set-top box. Any new iPhones or iPads, or the much-rumoured iTV, seem highly unlikely, with new Apple phones and tablets due later in the year and normally given their own launch events. We'll be reporting the news from Apple's WWDC as it breaks. In the mean time, catch-up on the Apple iRadio rumours below. Published 07.06.13: Reports suggest Apple now has Sony Music signed up to its iRadio streaming music service, fuelling the rumours that suggest Apple will unveil iRadio on Monday at WWDC. AllThingsD reports that Sony Music has signed on the dotted line, joing Warner Music Group and Warner Chappell. The site reiterates that it expects to see an official Apple announcement on Monday at Apple's Worldwide Developers Conference. More on Apple iRadio below in our original story from earlier in the week. Apple’s much anticipated iRadio streaming music service is one step closer to launch after Apple struck a licensing deal with Warner Music Group and Warner Chappell, according to sources close to the company. The New York Times and Wall Street Journal report that iRadio will be unveiled at its Worldwide Developers Conference starting on June 10. However the service won’t be publicly available until later this year, when Apple’s iOS 7 mobile-operating system is also expected to be released. Similar to Last.fm and US site Pandora, iRadio will stream songs based on users’ tastes. A station can be created based on a particular song or artist, and the program will then play other songs based on those preferences. The new technology will also be tightly integrated with iTunes, enabling people to buy and download a song they hear on the iRadio service. Rumours have circulated that Apple would offer "high quality sound", potentially hi-res audio, either via iTunes or as part of a new streaming service. Fingers crossed. The Financial Times reports Warner signed the deal after Apple agreed to pay its songwriters 10 per cent of advertising revenue, more than double the 4 per cent rate it currently earns from Pandora. A Sony ATV spokesman was said to be “optimistic [Apple] will accept our introductory rate”, but declined to comment further to the FT. The latest venture from Apple will see a shift in how the company courts advertisers after failing to compete with Google in the $4.11 billion U.S. mobile-ad market. They will seek to land big brands for the new streaming-radio service – similar to Pandora’s business model – scaling back its role as a network that places marketing messages in mobile software from its App Store. Apple has been negotiating with music companies in order to secure licensing agreements necessary to introduce the service. Reports suggest that so far the company has reached agreements with Universal Music Group’s record labels and Warner Music Group. Last month, Google launched its own streaming music service, Google Play Music All Access, combining its existing music store and cloud service with a streaming music offering. There's no word on a UK release date as yet for the service, which will have the likes of Rdio and Spotify in its sights, not to mention any Apple streaming service.